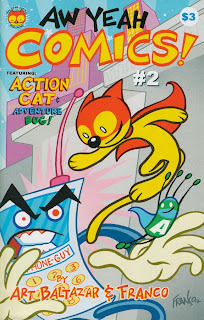 This past weekend, I attended Aw Yeah Comics' (the store) Second Anniversary Bash. A month or two back, a cousin of mine said that he had noticed this kind of new comics shop open near him and was wondering if I'd ever been to it. I hadn't -- it's just out of the way enough to be a little inconvenient for me -- but I was certainly aware of it and wanted to at least stop by to check it out at some point. Then he suggested that if/when I decide to do that to let him know, so that he could check it out too. He appreciates local shop owners and wants to help support them, but he hadn't been in a comic book shop for a couple of decades and wouldn't know where to start. Well, since I knew their anniversary party was coming up, I suggested we target then. So we met at the shop around 8:00/8:30 in the evening, a good hour and a bit after things kicked off. My cousin kind of got wrapped up into a conversation with Marc Hammond (who co-founded the place and I think handles the day-to-day management) as he was walking in. Then we grabbed a couple drinks and started looking around. They had pushed the center shelves that housed some toys and a few long boxes to one wall to allow for a little more movement, but you could still tell that it was a generally open atmosphere most of the time, even with the coffee table and comfy chairs in the center. The place was packed with people, though, and they seemed to have a great turnout. Which made for a great atmosphere, but a tad difficult to do a whole lot of browsing. From what I could see, though, it was a really nice shop with a good mix of material available. Very friendly and inviting layout and colors and such. If it were closer, I could easily see myself being a regular there. Hammond checked us out, and we chatted a bit more with him. About the signed Kristen Bell photo he's got on the back wall, the other shop who was stocking up on various issues of Aw Yeah Comics (the comic book) while we were there, their mailing list... But what stood out to me was Hammond's response to our saying that we had a great time and it seemed like a great place. He said that they try to hold parties like this pretty regularly and make it just a fun place to be. And that most of the people who were there that night -- the ones who were casually chatting and drinking like old friends -- most of those people didn't know each other six months ago. These parties not only were there to drum up new business, but also to help create and cement relationships. What kind of goes unsaid with that is that they're working to make Aw Yeah Comics (the store) a destination in and of itself. Sure, you can buy the latest issue of Action Comics there, but they're establishing the store as a place to go. You can get your comics from any of a number of places, but you go to Aw Yeah (the store) so you can hang out with the other people who go to Aw Yeah (the store), some of whom are comic creators in their own right. The shop isn't a means to an end, it's its own end. I don't know how much money the laid out for this party, but they seemed to have plenty of drinks and snacks for everyone. And I expect most of the people there would come to the store regardless if they had parties or not. So it wasn't really a "necessary" business expense, and one that I haven't seen too many shops employ. It costs money, and probably doesn't show any direct returns. But it goes a long way to fostering a community. A group of people who come together, not just as comic fans, but as fans of the shop itself. And even though it's a business decision here, it's one based on a very genuine sense of kinship and getting in touch with their audience. That leads to a kind of shop loyalty that you don't see in many other industries, and probably very few within comics. I've been arguing this comics-shop-as-destination model for several years now, and it's great to see it executed so well and working exactly as it should. Nice. That sounds a lot like how Carol & John run their store. I hope it works (I presume it works well enough), because the result is fun. I'm hardly at the comic store, these days, yet I'm planning to stop by tomorrow for their Hellboy Day celebration. One of these days, I'm going to make it up to Carol & John's! Cheers! If you do, you really need to try to see a store event. It's a cool store, but the difference between day at the store and store event has gotten amazing. Fortunately, they have a good number throughout the year! Do let me know if you make it by some day.